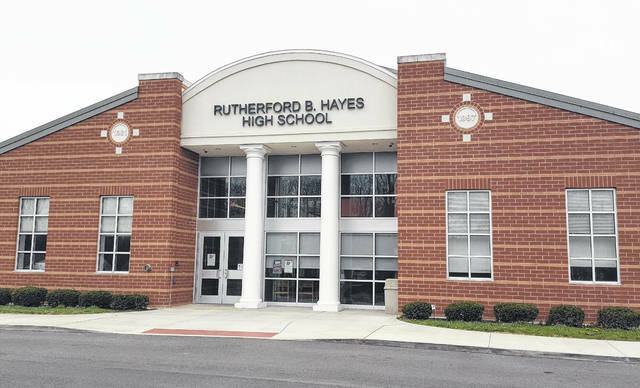 Pictured is the Euclid Avenue entrance at Rutherford B. Hayes High School in Delaware. Through donations from several Delaware businesses and individuals, Hayes seniors in need of a cap and gown won’t go without when graduation takes place on May 26. The 2018 class at Delaware Hayes High School is set to graduate next month. Students getting their caps and gowns is often a big realization that they are nearing completion of the biggest chapter in their lives to date. Several local businesses in Delaware have come together to ensure every student graduating this spring will be afforded their own caps and gowns. When Kimberly Zoob, owner of Real Big Puppy on South Sandusky Street, learned of a number of students who were unable to pay for their caps and gowns, she sought out the assistance of the community to ensure those students were covered. A posting on the Delaware Merchants Facebook page was all it took, and within a day, over $1,250 was raised to cover every student in need of a cap and gown. The businesses who answered Zoob’s call include Garage 26, Sandusky Street Barber Shop, Delaware Antique Mall, Son of Thurman, The Greater Gouda, The Bare Bowl, The Strand Theatre, Opa, Fundamentals, Converse Insurance, Re/Max Allegiance and Whit’s. Two personal donations were also made from Ali Kahle, who volunteers at Main Street Delaware, and Delaware Economic Development Director Sean Hughes. Delaware Hayes’ graduation ceremony will take place on Saturday, May 26 at 10 a.m.